The Toyota RAV4 is a compact crossover SUV and it's one of the best-selling vehicles in America, a competitor for cars like the Honda CR-V and Ford Escape. With the RAV4, Toyota has the right crossover for the right craze. Initially offered as a tall-riding, four-wheel-drive vehicle with more storage space, the RAV4 has evolved into a family-friendly shape with good fuel-efficiency. A redesign for 2019 gives the popular Toyota crossover new, buffer looks, a roomier interior, and the promise of better driving dynamics. The RAV4 is sold in standard and hybrid models. A redesigned RAV4 bowed at the 2018 New York auto show. Beneath its blockier, more SUV-like styling, the latest RAV4 is still a crossover aimed primarily at road, rather than dirt, use. Under its hood sits a 2.5-liter inline-4, while a hybrid version with a nickel-metal hydride battery tucked under its rear seat is available. The RAV4 Hybrid promises enhanced performance with better fuel economy, representing a major shift in the way Toyota offers its hybrids. 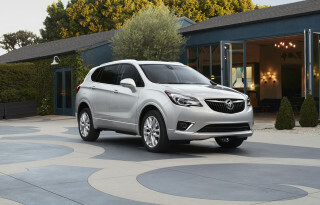 Gas models use an 8-speed automatic, while a CVT is standard fare on the hybrid. All-wheel drive is optional with the gas engine and standard with the hybrid. 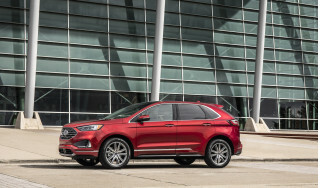 Interestingly, higher-trim non-hybrids use a special all-wheel-drive system with torque vectoring that improves on- and off-road traction but unfortunately uses more gasoline. The RAV4's interior is far nicer than before, with soft-touch materials, convenient storage bins, and standard Apple CarPlay. On the safety front, the RAV4 includes automatic emergency braking, adaptive cruise control, and active lane control on every trim level. The latest RAV4 has seating for five, but a low roofline limits ingress and egress. The cargo area doesn't suffer, however—it's plenty spacious. Overall, the RAV4 is about the same size as its predecessor outside even though it rides on a new platform. 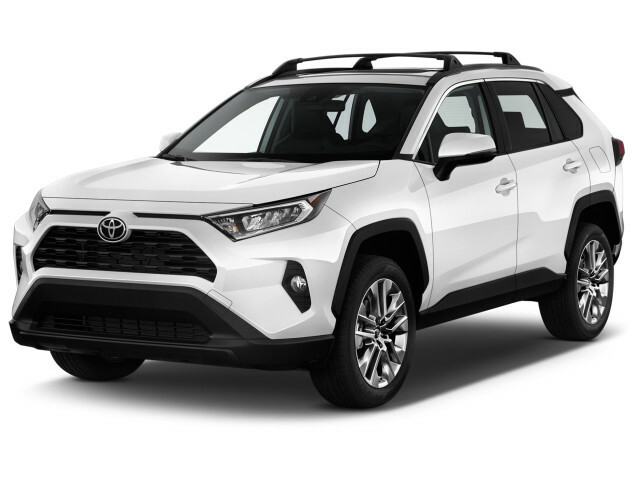 The RAV4 lineup spans a wide range and includes an off-roady Adventure trim level with special styling touches and additional traction control modes for slippery surfaces. The first generation of the RAV4 was introduced in 1996, borrowing a host of Corolla and Camry components. It came with a 120-hp, 2.0-liter 4-cylinder engine with either a front- or all-wheel-drive configuration. In 1998, the RAV4 received slightly restyled front and rear fascias, and a soft-top two-door was made available in some markets. The second generation of the RAV4 arrived in time for the 2001 model year and came packing a more potent, 148-hp, 2.0-liter engine. A facelift was implemented for the 2004 model year, consisting primarily of new bumper designs, while the 2.0-liter engine was replaced by a 161-hp, 2.4-liter 4-cylinder engine. For the 2006 model year, the RAV4 received its first major overhaul, which included an all-new platform. Engine options expanded to a choice of a 4-cylinder or V-6 powertrain. During that generation, the RAV4 saw occasional styling updates, while a switch to a 2.5-liter 4-cylinder engine was the only major mechanical change from the previous generation. One notable functional option came by way of an available sport package, which swapped the side-hinged rear hatch door for a top-hinged unit without the rear-mounted spare tire. This would return later as standard equipment. For this period, the Toyota RAV4 was offered with either the base 179-hp, 2.5-liter 4-cylinder engine or the top-spec 269-hp, 3.5-liter V-6. 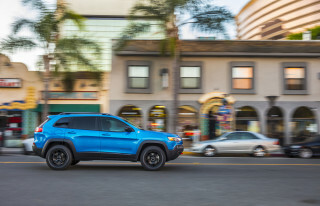 A manual transmission option was not offered on the RAV4, so instead the 4-cylinder model made do with a 4-speed automatic while the V-6 model was mated to a 5-speed auto. Fuel economy came in at 21 mpg city, 27 highway for the 4-cylinder model and 22 mpg city, 28 highway for the V-6. The RAV4 was redesigned for 2012 and was roughly the same size as the previous model, but was thoroughly updated. For starters, Toyota dropped the third-row seat option from the lineup, leaving the three-row duties to the larger Highlander. While the wheelbase of the RAV4 stayed the same as the prior generation's, it lost about two inches of overall length. The interior volume slightly increased, and the rear seats fold down flat to expand cargo space. The rear opening became a top-hinged tailgate, and the spare tire, which used to be mounted outside the vehicle on a side-hinged rear tailgate, was tucked under the cargo floor. This improved both aerodynamics and styling. 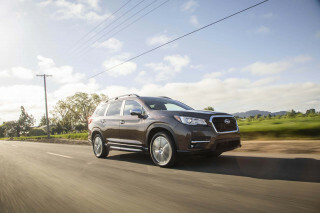 The base drivetrain was 2.5-liter 4-cylinder with 179 horsepower teamed with a 6-speed automatic. Front-wheel drive was standard, and all-wheel drive with new electronic controls to improve handling was an option. For 2016, Toyota added two models to the RAV4 range with the intention of better filling out the lineup. The RAV4 received its first hybrid variant, using a version of the powertrain offered in the Camry Hybrid as well as other Toyota and Lexus models, with fuel economy of up to 34/31/33 mpg. And at the fun end, the RAV4 received an sporty-looking and sport-tuned SE model. It looks a bit more aggressive than the rest of the models and offers improved handling, although no more power. All 2016 models received upgraded interiors, more sound deadening, new gauges, and an available surround-view camera system. For 2017, a new range-topping Platinum model delivered the highest level of luxury yet in a RAV4—for a price, at least. But the biggest change is that all RAV4s came standard with automatic emergency braking, adaptive cruise control, and lane departure warning as standard equipment. 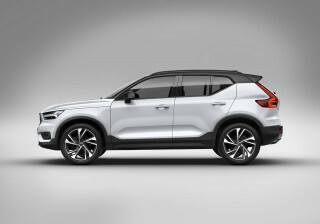 For 2018, a new Adventure trim level pairs a slightly higher ride height with a few cosmetic bits to take on buff rivals. The RAV4 re-emerged as a safety star. In IIHS testing, the RAV4 earned "Good" scores across the board; with automatic emergency braking and optional LED headlights, earned a Top Safety Pick award. The RAV4 retained a five-star score from the NHTSA. The Toyota RAV4 was joined by a distant cousin: the Lexus NX was based on some of the same running gear, though with its own styling and features, as well a turbo-4 that wasn't offered on the RAV4. I love the more aggressive look of the new RAV4, along with the upsized fuel tank on the hybrid version. This is the RAV4 I've been waiting for. THAT FENDER DOESN'T LOOK GOOD. I AM INTERESTED TO BUY THIS MODEL BUT I DON'T LIKE THE FENDER DESIGN SO I WILL WAIT UNTIL IT WILL GO BACK TO NORMAL-CURVY ROUND DESIGN. Only Adventure Trim looks good. Front grille is still too weird on other trims. Toyota needs to stop making weird and nauseous front grille designs. Only the Adventure trim looks good because it does not look like it's about to throw up on the pavement.